The authors describe the indications, surgical technique, and clinical results of this hybrid technique for fixation in revision total knee arthroplasty. Routine use of stems has been shown to improve outcomes and the survival rate in revision total knee arthroplasty (TKA). [1-3] Stems supplement component fixation, acting to bypass bone defects, offload deficient bone, and reduce interface stresses of damaged bone in the distal femur and proximal tibia. The optimal method of stem fixation in revision TKA, however, continues to be debated in the literature. Several studies have demonstrated good long-term clinical results with cemented stems in revision TKA. [4-6] Cemented stems provide immediate fixation with less intrusion into the intramedullary canal. However, they can be a challenge to remove and, theoretically, can increase stress shielding surrounding the metaphyseal bone. In this article, we will describe the indications, surgical technique, and clinical results of this hybrid technique for fixation in revision TKA. Press-fit stems should be considered for all patients with a failed primary TKA. Patients must have structural integrity of both the femoral and tibial canals to accommodate a wider press-fit stem. The intramedullary canals should be correlated with the mechanical axis of the limb, as the stem will dictate the position of the components. Care should be taken to ensure the components are appropriately lateralized for patellar tracking, as longer press-fit stems can result in improper component positioning, particularly the tibia where the canal is posteromedial relative to the plateau. Most manufacturers make offset stems to solve this problem. Patients with large metaphyseal bone defects and soft tissue laxity are also good candidates for press-fit stems. Longer uncemented stems will bypass the bony defect and provide more support in the rotational and bending planes. There are several relative contraindications to the use of uncemented stems in revision TKA. Patients with wide, osteopenic intramedullary canals often require cement fixation. In the case of infection, press-fit stems are unable to deliver local antibiotics; a fully cemented canal is a better choice. End-of-stem pain has been described with older cobalt chromium uncemented stems. This occurs less frequently with the newer, fluted titanium stems. Following is the surgical technique used by the authors for hybrid fixation in revision TKA. Regardless of the type of fixation, adequate surgical exposure must be obtained to gain proper visualization and allow for safe removal of implants with minimal iatrogenic bone loss. Once the implant is removed, thoroughly debride the area of all fibrous tissue and remaining cement to allow for proper implant fixation to host bone and to avoid eccentric canal reaming and potential perforation due to retained cement. Femoral and tibial intramedullary canal debridement can be facilitated with instruments such as the “back scraper” and cement-removing osteotomes typically found in the Depuy Moreland set (Warsaw, Indiana). Reconstruction of the tibia should be done first, as tibial reconstruction can affect the flexion and extension space and acts as a foundation for revision TKA. Tibial component revision begins with a “freshen up” cut on the tibia. This resection can be performed using a “free-hand” technique, with the use of an extramedullary guide, or with an intramedullary guide and an attached resection guide. The authors’ preference is to make tibial resection with an intramedullary guide with a 0° slope resection guide. The tibial canal is either reamed by hand or on power to determine the appropriate sizing of the canal. Once the canal diameter has been determined, a reamer handle is left in the canal and used as a guide for the resection. A common tendency is to undersize the femoral and tibial stems to avoid creating a periprosthetic fracture. A tibial resection guide is typically secured in position over the intramedullary guide with two drill pins, as the remaining anterior cortical tibial bone is often sclerotic, which makes placement of mechanical pins with a mallet difficult and inaccurate. The 0° guide allows for the resection to be made from any position – medial or central, depending on the ability of the patellar tendon to be mobilized laterally. Guides that are sloped can result in a varus resection if the cut is made medial to lateral, resulting in a biplanar proximal tibial resection. Following tibial resection, the intramedullary reamer is maintained in position and a tibial sizing tray of the appropriate size is placed in the proper external rotation. Many companies provide an offset bushing to help the surgeon determine the amount of offset needed for reconstruction. Most revision TKA systems offer 4- to 8-mm of offset. Most commonly, the tibial tray sits posterior and lateral from the intramedullary tibial canal. Drill pins are used to secure the tray in its final position, and the degree of offset is recorded. A drill and a punch are used for final preparation of the proximal tibia. All instrumentation is removed and the trial tibia with the appropriate diameter offset stem in the proper offset position is assembled and placed on the tibia. A 100-mm-length stem is typically used for the tibial reconstruction (Figure 1). Figure 1. Hybrid fixation of the tibial component. Bone wax is applied to the interface between the metaphyseal component and the stem to facilitate removal if further revision is necessary (a). Cement is applied to the metaphyseal component of the implant. Attention is now turned to the femur for reconstruction. In a patient who needs a revision TKA, the femur is typically looser in flexion than in extension and often, the tendency is to raise the joint line. Most commonly, the femoral component that was removed was upsized one size and an augment was placed posterolaterally to assist with component external rotation, with an augment placed distal medial and distal lateral to avoid creating excessive patella baja. The femoral canal is again reamed either by hand or on power to determine the appropriate canal diameter. Once the diameter has been chosen, a component one diameter smaller is often selected for the purpose of trialing. The offset stem is typically placed in a posterior position; however, the stem is placed on the trial femur in a loose manner so the canal and the remaining host femoral condyles can assist in finding the correct alignment and component position, respectively. The stem length on the femoral side is typically longer, in the range of 150mm (Figure 2). Figure 2. Hybrid fixation of the femoral component. Note the presence of bone wax again (a). Cement is applied to the metaphyseal component of the implant. Once the final component sizes have been chosen for both the femur and the tibia, all trial components are removed and the final components are assembled on the back table. Two batches of cement, containing 2 grams of antibiotics per batch, are used to cement each component. The tibial component is cemented in position first. The cement is placed under the tibial tray to include the modular junction and slightly beyond. The same cement technique is used for the femur. All excess cement is removed and a trial polyethylene of the appropriate thickness is placed in position while the knee is brought out to full extension during the cement curing process. The stems in this type of reconstruction assist with construct alignment, as well as protect the remaining host metaphyseal bone stock. They are not in-growth surfaces; they act, instead, as a “deep nice-post” to perform the functions previously stated (Figure 3). Figure 3. AP (top) and lateral (bottom) postoperative radiographs of a patient undergoing revision TKA with press fit femoral and tibial stems and cemented metaphyseal components. This technique demonstrates why undersizing of the stem on both the femoral and tibial sides is suboptimal, as an undersized stem may result in instability of the construct and lead to early loosening. Favorable mid-term outcomes have been demonstrated for press-fit stems use in revision TKA. Table 1 summarizes the clinical studies. 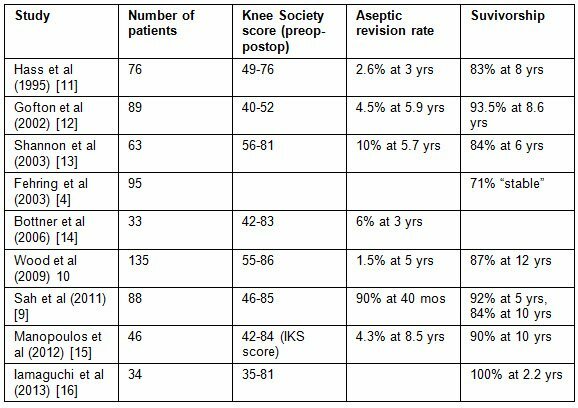 In a retrospective series of consecutive patients undergoing revision TKA with a hybrid technique, Sah et al reported 92% survivorship at 5 years and 84% survivorship at 10 years. Wood et al reported similar results, with a survivorship from aseptic loosening of 98% at 12 years. Patients in both series reported good functional outcomes. Although prospective studies comparing cemented stems and hybrid fixation with long follow-up are still needed, press-fit stems are a reliable option for fixation in revision TKA. P. Maxwell Courtney, MD, and Neil P. Sheth, MD, are from the Department of Orthopaedic Surgery, University of Pennsylvania, Philadelphia, Pennsylvania. Wayne G. Paprosky, MD, is from the Department of Orthopaedic Surgery, Rush University Medical Center, Midwest Orthopaedics, Chicago, Illinois. Bertin KC, Freeman MA, Samuelson KM, Ratcliffe SS, Todd RC. Stemmed revision arthroplasty for aseptic loosening of total knee replacement. J Bone Joint Surg Br. 1985;67(2):242–248. Brooks PJ, Walker PS, Scott RD. Tibial component fixation in deficient tibial bone stock. Clin Orthop Relat Res. 1984;(184):302–308. Fehring TK, Odum S, Olekson C, Griffin WL, Mason JB, McCoy TH. Stem fixation in revision total knee arthroplasty: a comparative analysis. Clin Orthop Relat Res. 2003;416:217-224. Murray PB, Rand JA, Hanssen AD. Cemented long-stem revision total knee arthroplasty. Clin Orthop Relat Res. 1994;309:116-112. Maybry TM, Vessely MB, Schleck CD, Harmsen WS, Berry DJ. Revision total knee arthroplasty with modular cemented stems: long-term follow-up. J Arthroplasty. 2007;22(supple):100-5. Parsley BS, Sugano N, Bertolusso R, Conditt MA. Mechanical alignment of tibial stems in revision total knee arthroplasty. J Arthroplasty. 2003;18:33-36. Peters CL, Craig MA, Mohr RA, Bachus KN. Tibial component fixation with cement: full versus surface-cementation techniques. Clin Orthop Relat Res. 2003;409:156-168. Wood GC, Naudie DD, MacDonald SJ, McCalden RW, Bourne RB. Results of press-fit stems in revision knee arthroplasties. Clin Orthop Relat Res. 2009 Mar;467(3):810-7. Haas SB, Insall JN, Montgomery W 3rd, Windsor RE. 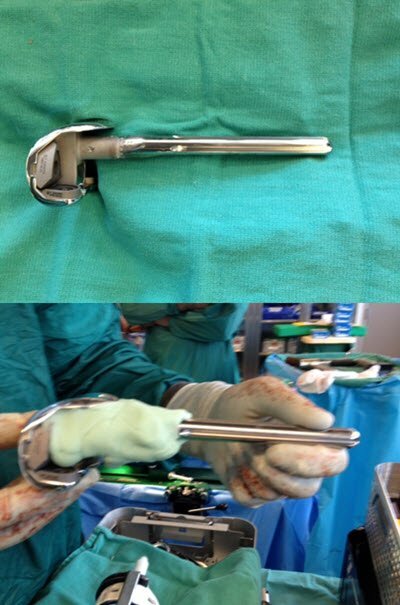 Revision total knee arthroplasty with use of modular components with stems inserted without cement. J Bone Joint Surg Am. 1995;77:1700–1707. Gofton WT, Tsigaras H, Butler RA, Patterson JJ, Barrack RL, Rorabeck CH. Revision total knee arthroplasty: fixation with modular stems. Clin Orthop Relat Res. 2002;404:158–168. Shannon BD, Klassen JF, Rand JA, Berry DJ, Trousdale RT. Revision total knee arthroplasty with cemented components and uncemented intramedullary stems. J Arthroplasty. 2003;18(suppl 1):27–32. Bottner F, Laskin R, Windsor RE, Haas SB. Hybrid component fixation in revision total knee arthroplasty. Clin Orthop Relat Res. 2006;446:127–131. Manopoulos P, Havet E, Pearce O, Lardanchet JF, Mertl P. Mid- to long-term results of revision total knee replacement using press-fit intramedullary stems with cemented femoral and tibial components. J Bone Joint Surg Br. 2012 Jul;94(7):937-40. Iamaguchi MM, de Castro FB, Gobbi RG, Tirico LE, Pécora JR, Camanho GL. 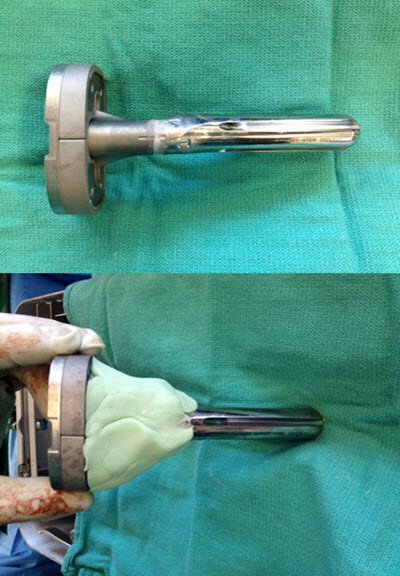 Results of revision total knee arthroplasty using press-fit cementless stem. Acta Ortop Bras. 2013 Jan;21(1):23-6.